Smaug came hurtling from the North, licking the mountain-sides with flame, beating his great wings with a noise like a roaring wind. Against him stood – a hobbit. Poor Bilbo Baggins! A plump and unassuming hobbit (as those small, furry-footed people tend to be), Bilbo hates adventures. 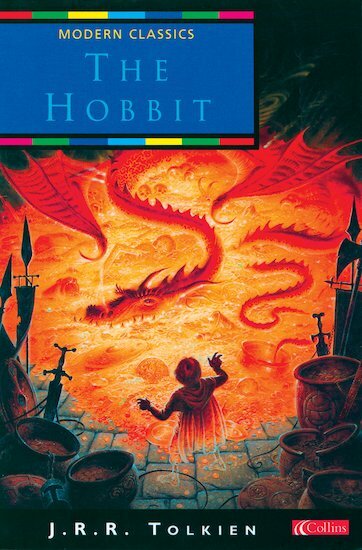 But one day a knock at the door tugs him into a crazy quest, and before long Bilbo is on the road to danger! Whisked from his comfortable hobbit-hole by Gandalf the wizard and his band of dwarves, Bilbo finds himself caught up in a plot to raid the treasure hoard of Smaug the Magnificent – a large and very dangerous dragon. Whatever next? As he faces trials and perils both little and large, is there any hope for Bilbo Baggins? The dazzling fantasy that came before The Lord of the Rings is a book you won’t be able to put down! Wonderful, I enjoyed the movie more. One of the best fantasy books! The Hobbit is utterly fantastic. It’s a great adventure story filled with wonderful characters and hilarious moments. Definitely recommend! it took me aaggeesss to read this book! its okay, i dont like it but i dont hate it either. i would recommend it to 13 years and up.